Intuitive Surgical pioneered robotically-enabled surgery and for years largely had the field to itself, in the process building one of the most successful medtech companies ever. 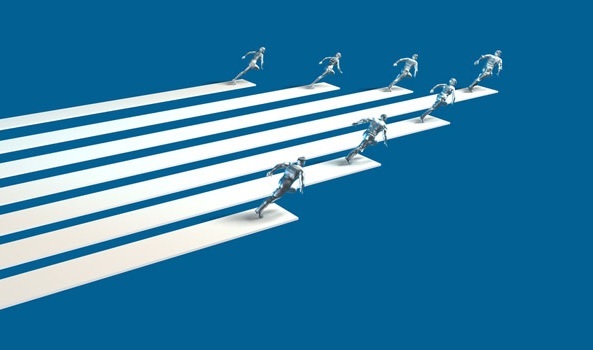 But now, as the company nears its 25th anniversary, robotics is facing major changes, with both increased competition and the incorporation of advanced analytics. Can this long-time leader stay ahead of the game? Part 1 of a 2-part feature. Medtech and pharma have long stood on opposite sides of a culture divide. Talk of drug-device convergence has, mostly, remained just that. But digital technology is now bridging the gap, creating new treatment modalities where data, not tools or drugs, are king. Portfolia’s model of investing is designed for a new generation of female investors. It combines the engagement of Angel investing with the professional management of venture capital. Many young companies are working on new approaches to improving infectious disease testing, almost all with an eye toward some of medicine’s most incalcitrant challenges: earlier diagnosis of sepsis and faster susceptibility testing. Several new promising options are available, but so far, none of these is comprehensive and it remains to be seen whether any will be threats to entrenched large companies. After several years of waiting for the public market to re-open, medtech IPOs continue to remain healthy, while M&A deal numbers turn flat and valuations drop. Co-founded by a renowned heart surgeon, Adagio Medical reexamines the key success factors of cardiac ablation for atrial fibrillation and offers a solution for some of its most vexing challenges. Adagio’s iCLAS system and OneShot+ catheter enable faster, more effective cryoablation than today’s balloon-assisted methods by using proprietary Near-Critical Nitrogen technology. When queried, women asked for a non-hormonal solution to vaginal dryness that could be used in the home. They preferred a noninvasive therapy that would be discreet, easy to use, and would not need to be inserted into the vaginal canal. Women’s health company Madorra Medical is well on its way to granting their wishes. 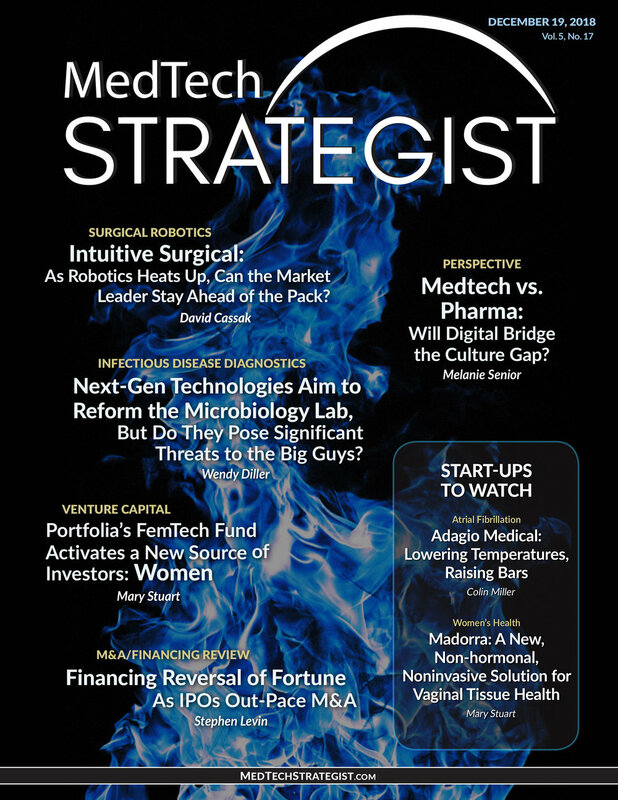 Companies Covered in this Issue: Accelerate Diagnostics Inc., Adagio Medical Inc., Allergan PLC, Alma Lasers, Alphabet Inc., Amazon.com Inc., Amgen Inc., Apellis Pharmaceuticals, Apple Inc., Beckman Coulter Inc., Becton Dickinson & Co., bioMerieux Inc., Boston Scientific Corp., ChromaCode Inc., CMR Surgical Ltd., Corindus Vascular Robotics Inc., Curetis NV, Day Zero Diagnostics Inc., DexCom Inc., DistalMotion SA, Enable Injections Inc., Establishment Lab Holdings Inc., First Light Biosciences, Flex Digital Health, Flex Ltd., Fotona, Fresenius Medical Care AG & Co. KGAA, Future Family, Galen Robotics Inc., GlaxoSmithKline PLC, Glooko, Google, Hill-Rom Holdings Inc., Hologic Inc., IBM Watson Health, Immunexpress Inc., InMode Aesthetic Solutions, Inflammatix Inc., Inspire Medical Systems Inc., Intuitive Surgical Inc., Johnson & Johnson, Joylux Inc., Karius Inc., Luminex Corp., Madorra Medical, Magnolia Medical Technologies Medical Microinstruments SPA, Medtronic PLC, Novartis AG, Novo Nordisk AS, OpGen Inc., Otsuka Pharmaceutical Co. Ltd., Panasonic, Pear Therapeutics Inc., Predigen Inc., Proteus Digital Health, Qiagen NV, Qvella Corp., RoboCath Inc., Roche, Sandstone Diagnostics Inc., Sanofi, Sony, Stryker Corp., T2 Biosystems Inc. Thermo Fisher Scientific Inc., TransEnterix Inc., UCB SA, Venus Concept Medical Aesthet­ics, Verb Surgical Inc., Verily Life Sciences, Viveve Medical Inc., Wright Medical Group NV, Zoetis Inc.